Buuuk’s goal from the beginning has always been ambitious—enable businesses do more so they can boost production, become more connected and cut costs. The digital solutions that Buuuk provides offer an updated way to organize data, automate processes, and improve an overall business. Through such a digital transformation, companies can achieve more with less. Buuuk helps facilitate digital transformation for all types of enterprises and startups across industries. 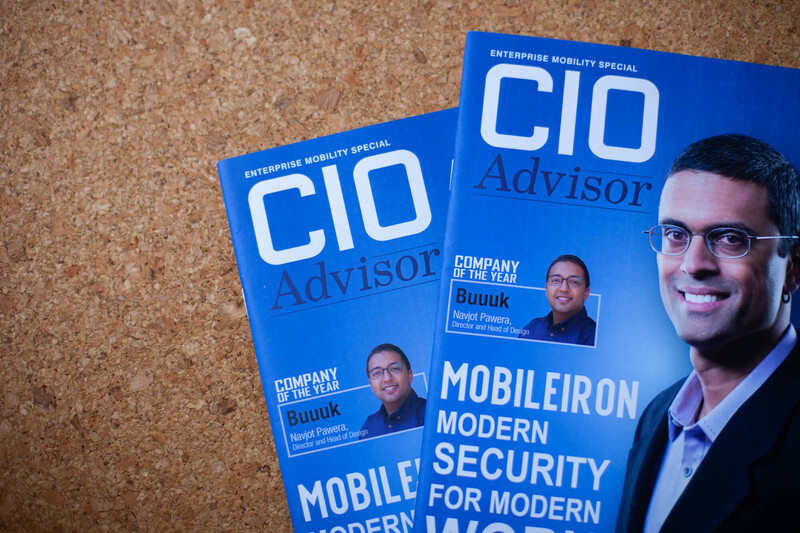 Because of this innovative approach to helping businesses become more digital, more automated, and more efficient overall, CIO Advisor has awarded Buuuk with their ‘company of the year’ award for Enterprise Mobility Solution Providers. Having started in 2008 with an “experimental” iOS app that offers a directory of eateries in their home base of Singapore, Buuuk has come a very long way up. NextRide, Klok, CleanLah, and WeatherLah are among Buuuk’s most notable apps, which have garnered praise for their convenience and ease of use. Mobile applications accounted for over 62% of enterprise mobility spending according to Enterprise Mobility Exchange (EME). 70% of the apps’ buyers sought a solution to increase productivity. Buuuk creates custom digital solutions that increase productivity and automate tasks to meet the wide demand for this kind of utility. Buuuk’s developers discover ways that a business’ process can be more efficient. The team compiles research, leaving nothing unchecked. Careful consideration is given to identifying tasks that can be automated by incorporating a function into their custom-made app. Prototypes are created and tested out to ensure that all of the client’s needs are being met effectively. App development, server-side development, UX (user experience) and UI (user interface) are all created by the team as a unit to ensure a seamless result. Client input and participation are encouraged throughout the development process because Buuuk wishes to make each app the ideal solution for maximizing their clients’ productivity. Client input contributes to making each app unique and original. Our systematic process for digital solution development is multifaceted, highly organized, and methodical. We call it adaptive agile methodology because each step is optimized for each phase of the process. It begins with the gathering of all requirements, followed by wire-framing, UI and UX development, platform development, QA and testing, and finally, release. Design – Buuuk uses an advantageous iterative design process. The Design Director and lead designer collaborate in meetings to ensure the best strategies are always being used, and ensuring the best results. Every week Buuuk has two reviews with the client during the design phase, all booked a month in advance for convenience. A detailed and frequently updated roadmap is always available for the client to access. Our design library is based on Atomic Design principles, and all design assets are shared over Invision. Development – Test builds are provided every Friday as well as bi-weekly sprints. Clients also receive weekly status emails. The project is managed by JIRA & Confluence. Testing & UAT – Regular testing is always carried out after significant builds. The client has access to all test scripts for full transparency. Having already worked with brands such as Mercades Benz, Starhub, Tupperware, SingTel, and many others, Buuuk now has plans to incorporate artificial intelligence, augmented reality, and blockchain technologies to revolutionize user interfaces and the overall user experience. As these three technologies are already starting to make a major impact on how we interact with apps, Buuuk plans to offer the potential these technologies have to more and more companies in new and exciting ways for the years to come.